As of Monday, January 21st, 2019 we will be following CompTrain LIVE (instead of at a one week delay). So if you want to see what the workout is in advance so you know what equipment to bring (like your jump rope), or what shoes to wear (Nano vs Metcon), or because you like to cherry-pick your workouts, then there are TWO places that you can check! 1. If you're a Sigma CrossFit member, login to your WODTogether account to see all the workouts there! 2. If you're not a Sigma CrossFit member (yet) or are maybe just in town for a drop-in, then point your browser to CompTrain to see what the workouts are straight from the source! Keep in mind, CompTrain always has REST DAYS programmed for Thursdays, but we will always have our own workouts programmed on those days for anybody that doesn't follow CompTrain's recommended competitors' schedule. Building in weight. Record heaviest load. ...2 Rounds of "Strict Cindy"
New training cycle starts today: "Racehorse." 10 weeks. 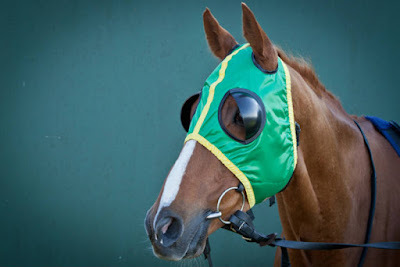 If you've ever watched a racehorse train or compete, you might have noticed they often wear blinkers, a piece of equipment that prevent the horse seeing to the rear and to the side. Blinkers keep racehorses focused on what is in front, encouraging them to pay attention to the race rather than other distractions. If there is ever a time of the year to put on the blinkers, it's now—specific 2019 Open training starts today. During this cycle, our primary focus will be dialing in movements that will be tested in the Open. Through study of past competitions, we can intelligently plan our final weeks of training to maximize our performance when the Open arrives. Time cap of 15 minutes. Compare to 2018-03-28.